Take a gander at what came out of the design house of Stacy Adams shoes. Stacy Adams decided to take their iconic shoe the Madison and give it a design twist. 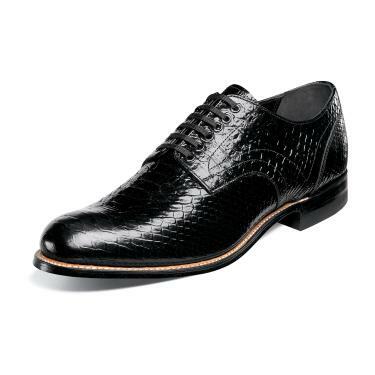 These Black Stacy Adams Madison Shoes feature the new Anaconda print leather uppers in a cap toe less look combined with their Goodyear welt construction, full durable leather sole and Goodyear rubber heal.